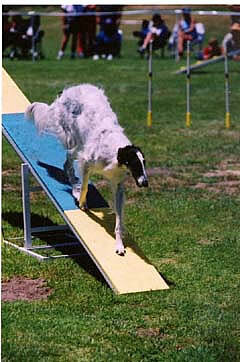 Éclair earned her CD in three Trials with a score of 193.5 and a lst place at the Borzoi Club of Northern California Specialty in 2001. CDX in three Trials with 193 average. 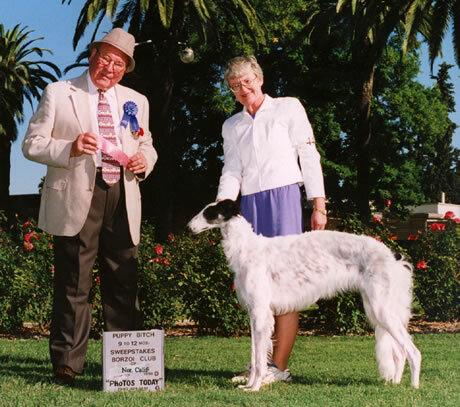 Shown a total of seven times in Obedience she has qualified every time she has been in the ring. 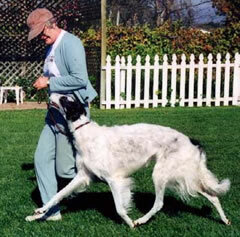 Éclair won lst place at the Borzoi Club of America National Specialty 1993 in Reno in Open B Obedience. 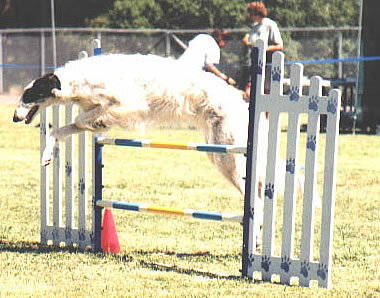 She was the only borzoi to qualify in Open. She loves to catch the Frisbee and run Agility Jumpers. She thinks Standard is very dull. She is well named .Éclair means Flash of Lightning. Éclair likes to run very fast. She is in training for Utility Obedience.